Our house is about 30 years old. 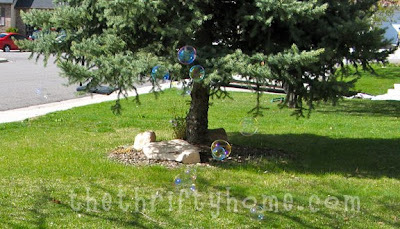 The first owners installed a sprinkler system and planted some trees in the front yard. 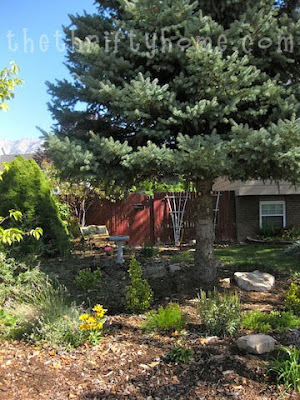 I love the mature trees in our yard, but the pine tree was so big and obtrusive. It blocked the sprinklers from watering most of the grass and took up a lot of space. 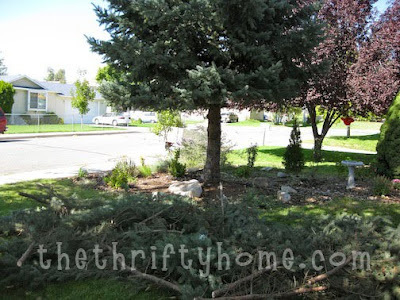 One of the first things I did when we moved into our home 8 years ago was to cut the bottom branches of the pine tree off. This helped the grass a little and opened up the yard a lot. A couple of years ago I got tired of mowing around the tree and the grass was still having a hard time. I decided to pull up all of the grass on that side of the yard and plant flowers. It makes mowing the lawn so much easier and I don't have to worry about the sprinklers getting all of the grass. See how open the yard is without the tree going all the way to the ground. 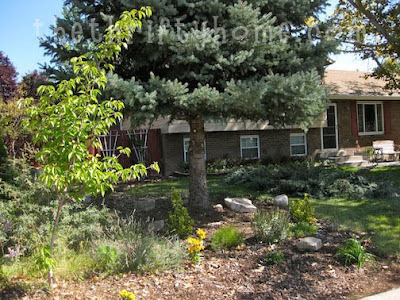 I did find a picture of the tree from about 5 years ago before I took out the grass. The first time we cut the branches we were a lot more reserved about it as you can tell from the picture below. I cut the branches myself this time, and I was a bit more bold. If you have one of these beautiful pine trees in your yard and you want to make your yard bigger, just cut the bottom branches off. No need to rip out the tree. And please remember if you are the one planting the tree, that 20-30 years from now it will be a large tree and not the cute little tree you are planting. To make the job quicker and easier, check out these chainsaw reviews. When I went inside after sawing off all of the branches I caught a glimpse of myself in the mirror and was a little shocked. I looked like I had been in a battle! 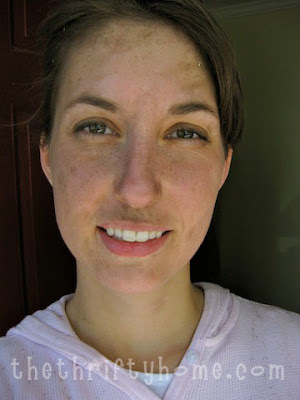 I hadn't realized that my face had gotten so dirty while under the tree sawing away. I even looked like I had a mustache. On the positive side, my teeth look white in comparison to my face. Oh, we have several trees like that in our 30 year old yard, too (5 to be exact). I'm really tired of weeding flower beds and am thinking of putting down tarp and bark - something I never thought I'd do. But, I just can't seem to keep up with the weeds here. So, what was the trick to getting rid of the grass? Did you just remove the whole grass layer - dirt and all? We "removed" some grass to reshape some flower beds, and it just keeps coming back - ARGG! We also "removed" the grass and it keeps coming back. You are supposed to use grass killer first and that will kill the roots. Then pull the grass out. I used the weed fabric and laid bark on the top and the grass and weeds come up thru the fabric. If you want to lay down weed fabric, you have to invest in the really expensive heavy duty stuff. Live and learn. Even though you have a dirty face in that picture, it's a really good picture of you, what a cutie you are!